A third employee had died from injuries caused by an explosion at a factory of Foxconn in Chengdu, China, the company said Sunday. Initial findings show the blast was caused by "combustible dust in a duct." 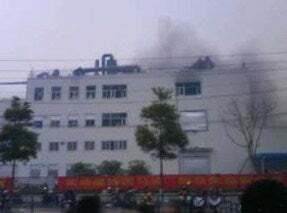 Taiwan-based Foxconn is still working with Chinese authorities to investigate the root cause of the explosion. Operations at the Chengdu factory have been suspended. Foxconn has also suspended production at its other factories that carry out "similar processing functions." Foxconn, a producer of products for companies like Apple, Motorola and Hewlett-Packard, has come under fire in the past for its working conditions. Last year a string of suicides occurred at Foxconn's Shenzhen factory. Apple has maintained that it works with Foxconn to ensure high safety standards at the supplier's factories..
Foxconn's Chengdu factory produces iPads, according to a May report by the Hong Kong-based watchdog group Students & Scholars Against Corporate Misbehavior (SACOM). SACOM estimates the work force at the factory to be 100,000 employees. The May report also said the occupational health and safety issues at the factory were "alarming." Workers interviewed complained of constantly breathing in dust at one of the campuses. "In the milling machine department in Chengdu, some workers state they always breathe in the aluminum dust. Workers in the polishing department also complain that the department is full of aluminum dust," according to the report. "Some workers comment that ventilation on shop floor should be improved." Foxconn has said that its Chengdu factory is a new site, still under construction. Apple did not comment on how the incident would affect production of Apple's iPad device. But the explosion has created concerns that it will lead to a shortage in iPads. But the explosion won't likely lead to any delays in iPad production, because Foxconn has backup systems to handle these kinds of emergencies, said Jamie Wang, an analyst with research firm Gartner. "However, this blast comes as another blow to Foxconn that further damages the company's image," Wang said. "Foxconn will have to pay more costs to improve the factory working environment and safety."